Bring order to your home and give your favourite novels a place to shine with one of our multifunctional bookcases, designed to add character and functionality to your home. Choose from a variety of styles from timeless oak to stylish mango wood. 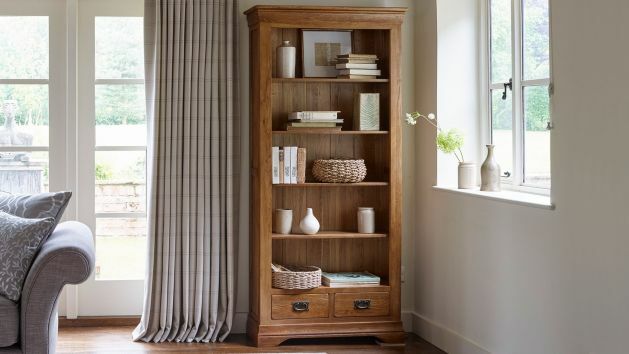 Ideal for adding character and storage to your home, a bookshelf will instantly give your space a stylish update. As well as holding your prized book collection, a good bookcase can also double up as a stylish display area for treasured knick-knacks, plants, or whatever other decorative ornaments you want to put in the limelight. Made from 100% solid oak and finished in a special wax coating, our bookcases are built to last and will retain their beauty for many years to come. Choose from a range of finishes from traditional sunny oak to painted and mango styles. Which bookcase would best suit my space? Think carefully about how you’ll use it and where you want to place it. Always measure your space carefully before you shop – if you’re planning to place your bookcase next to the window, be sure to measure the distance between the window and the wall, too. If your space is tight on room, try looking for a compact bookshelf that doesn’t take up too much floor space. It’s also important to think about the dimensions of your space – a tall bookcase can enhance the feeling of height, making the ceilings appear taller. If your space is prone to clutter, you might want to choose a bookcase with drawers that allow you to keep knick-knacks organised. It’s also important to think about what you want to display on your bookshelf. If you’re looking to use yours mainly for decoration rather than for storing books, choose a design that has spacious shelves, so there’s an ample amount of room for housing larger ornaments and plants. Play around with the height and size of items – try putting a large photo frame or vase next to a stack of horizontally-place books. If you’re planning to decorate it with ornaments, try to stick to a dedicated colour scheme for a pulled-together look. For a modern, undone look, experiment with the arrangement of your books by stacking books on top of one another as well as placing them vertically. Don’t be afraid to place ornaments on top of books either – you could even place them next to a cluster of books as a way of propping them up. Take advantage of free home delivery to the room of your choice – and, to make it even easier, we’ll give you a courtesy call ahead of time so you know when to expect us. We also offer a range of flexible finance options, with interest-free credit for 3 years on orders over £3,500.